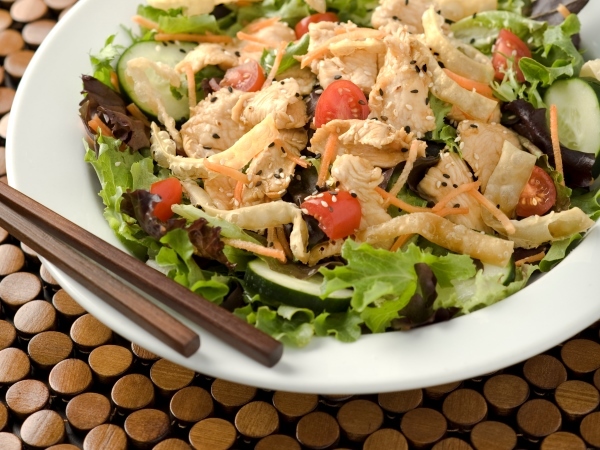 A simple chicken salad with complex flavours - soy sauce, fresh ginger, honey, Tabasco sauce, wine vinegar, onion, almonds and more. Fresh and delicious! Marinade – whisk soy sauce, ginger, garlic, canola oil, hoisin sauce, sesame oil, Tabasco sauce, brown sugar & honey together. Place chicken breasts in a bowl and add 3 tbsp. of marinade then mix well. Cover & refrigerate for at least 30 min., turning after 15 min. Whisk the vinegar and spring onions into the remaining marinade to form the dressing. Add seasoning to taste. Heat a grill pan over medium-high heat. Cook the chicken for about 4 min. a side, allow to rest, then slice. Toss the chicken, cabbage, carrots, green onions, coriander & half of the almonds with the dressing. Sprinkle with remaining almonds & sesame seeds. Enjoy!